HUAWEI will be introducing the exclusive Primrose Gold edition ( Huawei nova 3) on 27 September 2018. 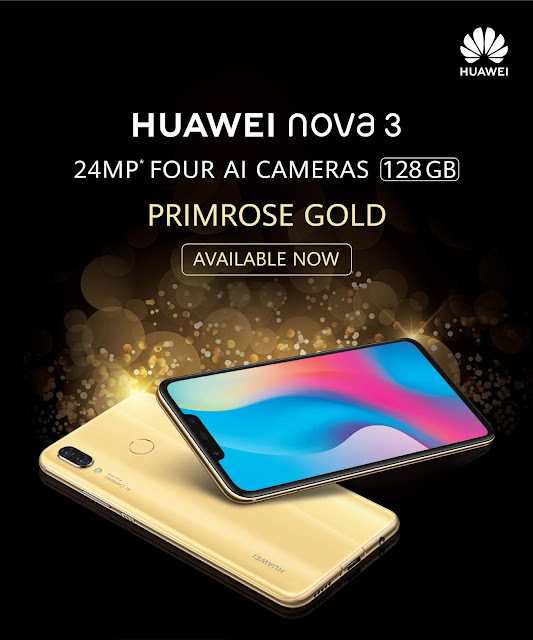 The brand new HUAWEI nova 3 Primrose Gold is HUAWEI’s effort in meeting the consumers’ demand, allowing them to be more versatile and express their artistic side. Other than Primrose Gold, the HUAWEI nova 3 is also available in three fashion-forward colours, namely Iris Purple, Black and Red. Empowering your selfies with the latest AI technology and four 24MP AI cameras, the HUAWEI nova 3 provides a phenomenal selfie photography experience. The HUAWEI nova 3 is powered by the Kirin 970 processor with 6GB memory for smooth usage experience and 128GB storage to store everything you need. It is also powered by HUAWEI’s latest EMUI 8.2 operating system to offer users a seamless smartphone experience. The HUAWEI nova 3 Primrose Gold is available at the attractive price of RM1,919, and can be purchased at all HUAWEI Experience Stores, HUAWEI online store and Digi stores. Each purchase of the HUAWEI nova 3 also comes with a FREE nova Privilege Card with rewards worth up to RM1,000. For more information, please visit https://consumer.huawei.com/my/ or HUAWEI’s official Facebook page www.facebook.com/HuaweiMobileMY and stay tuned as we are giving you a GOLDEN opportunity for you to grab soon!